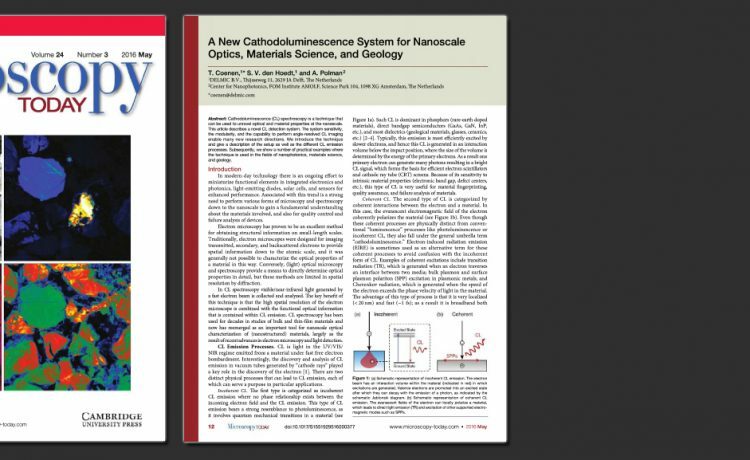 As the article explains, the combination of scanning electron microscopy with a cathodoluminescence detection system is a highly versatile tool that can apply several techniques to a variety of fields, including nanophotonics, materials science, and geology. For instance, the technique of angle-resolved imaging allows one to study the properties of nanophotonic systems which are essential to the development of solar cells, for example. On the other hand, In plasmonics, it is useful to obtain 3D information about a structure, for which CL tomography is used. This technique involves collecting a series of 2D images at various tilt angles, after which a complete 3D image is obtained. In materials science, CL is used to detect the light-emitting properties of various materials for the development of optoelectronic devices. Finally, in the field of geology, CL is particularly useful for petrology, which is the study of the origin, distribution, texture, and composition of rocks. The SPARC SEM CL system in particular offers all the possibilities mentioned above. In general, this technology is becoming increasingly more important as nanotechnology becomes more relevant to the industrial market. To read the full article, click here (pp. 12-18).